Faceting is a traditional technique seen in ancient Chinese ware and widely used by wheel based potters. The technique involves removing slices of clay from the outside of the pot to produce a multi-sided shape. Emily enjoys playing with the possibilities that this idea presents, and in particular adding an unusual twist to the facets. Some potters facet when the clay is wet: Emily chooses the more controlled approach of faceting at the leather-hard stage. 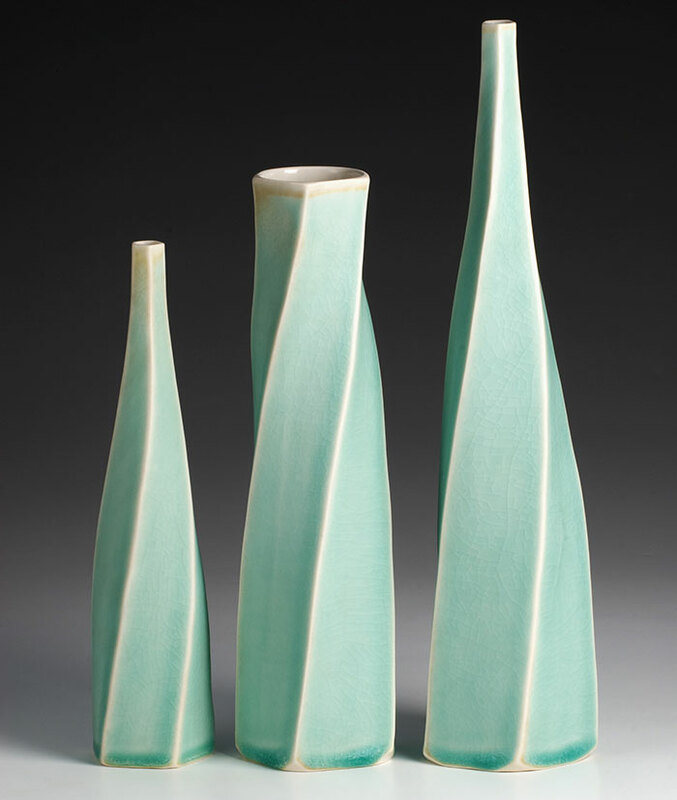 She is able to achieve very light pots, in this manner. The bottles are usually displayed in groups as there is a particular relationship which develops between the pots. These groups evoke the quiet restraint in the paintings of Morandi. This unusual form, came about through experimenting with the idea of flattening vessels, to extend the possibilities of throwing, and get away from the circular nature of the process. 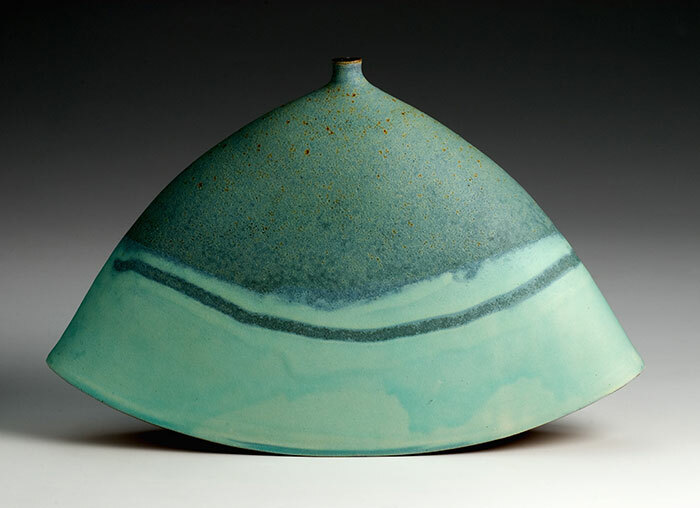 This piece, starts its life as a dome, it has its base cut off, and is then eased into its new flattened form. 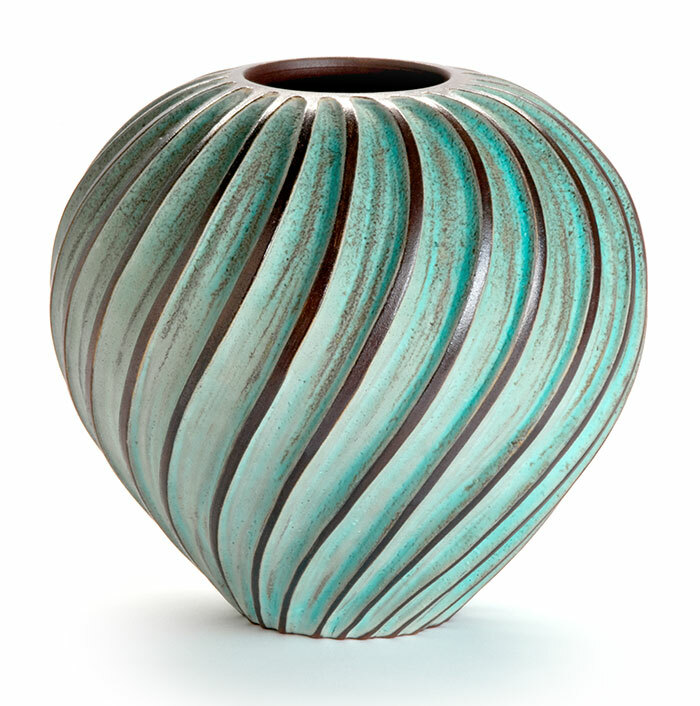 This lantern vase makes reference to the clean restrained style of Keith Murray (a ceramic designer working in Britain in the 1930’s). It was thrown on a bat (a round wooden board that can be detached from the wheel head), left overnight to dry, and replaced on the wheel. The horizontal stripes were then created with a reductive process. One and two pence coins are held against the form, to achieve this precise and exacting effect. The carved ball has become a signature piece for Emily Myers. This satisfying form makes reference both to furrows in ploughed fields and also to the precision of metal cogs. 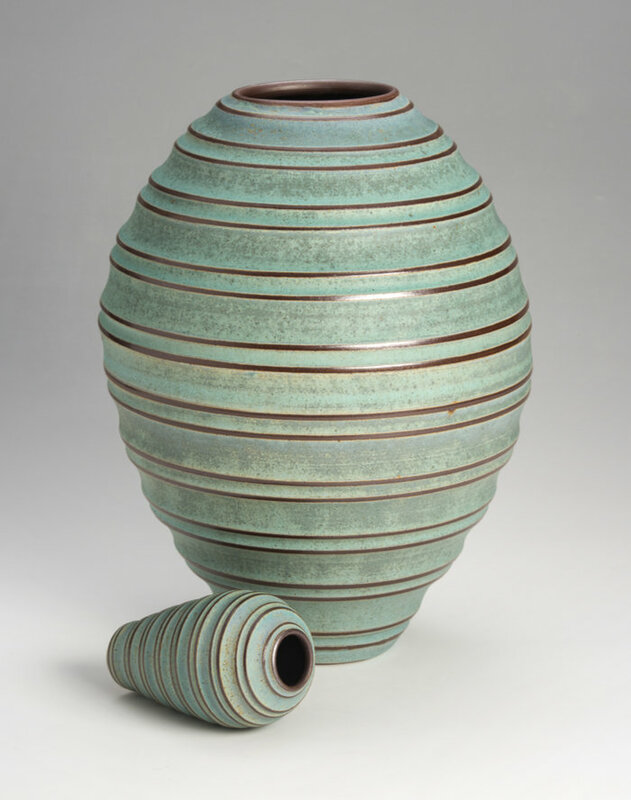 The green barium glaze and the sheen of the exposed red clay, perfectly complement the form. Emily is often asked how she achieves such even lines, and the answer is: a steady hand and a good eye. She marks out the lines in segments, before carving the pot with a fine bent-wire modelling tool. The time-consuming process, has an almost meditative feel to it.